Healthy Mama is an mHealth application intended to be used by community health workers (CHWs). The App aims to enable CHWs to detect maternal and child health cases at households and refer those that require further care. 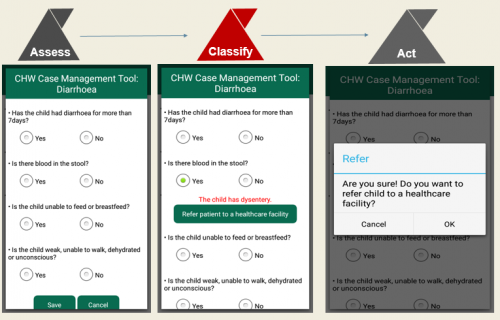 The App allows CHWs to follow a 3-step protocol to assess, classify and act. This protocol guides the overall flow of case detection and management by the CHWs. Community Health Workers still rely on paper based data collection tools which limit case detection and efficient management. Besides the inefficiency of paper based data collection tools, the lack of digital technology solutions in case management creates a higher workload on CHWs and thus results in poor quality of healthcare. Current mHealth interventions in South Africa primarily focus on data collection and not on case management and/or clinical decision support. Healthy Mama is an mHealth intervention that has a clear market need in the Provincial Departments of Health and Non-Governmental Organizations (NGOs). Healthy Mama is not just a data collection tool, it uses clinical algorithms to assist the CHW to detect danger signs in pregnant women and children under the age of 5. The solution allows a 2-way referral and communication between the CHW and the nurse at the clinic. The nurse is also able to access relevant case data on a web-application linked to the mobile App. Other mHealth solutions lack clinical decision support and only offer mere data collection of household surveys. 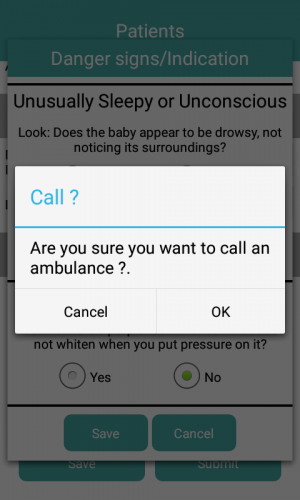 The solution allows wireless communication between simple medical devices and the mobile App. Users are able to screen for medical conditions and perform early detection of maternal cases such as preeclampsia all done at a household level by the CHW. Maternal deaths in Southern Africa still remain high. Complications due to hypertension in pregnancy related deaths account for over 14%. Community health workers are a key re-emerging workforce capable of strengthening health systems in developing countries if they are adequately equipped. mHealth offers an opportunity to capacitate community health workers in ensuring early detection of complications in pregnancy and thereby ensure early referral and link to care. The solution was developed in consultation with various skilled experts in the field of mHealth, maternal and child health such as the likes of Prof J Moodley, Dr. Kauchali, and Dr. Neil Moran. The National Department of Health of SA has written a recommendation for provinces to consider implementing this solution. A global NGO was also involved in field testing this solution to refine the proof of concept.